The marketing push to analyse every part of your online and offline life marches on. Today I noticed that leaving comments on Cisco’s Blog requires a sign in to Facebook or Twitter. I use Disqus to ensure that comments are, loosely, easier to manage and you can choose to have priacy. 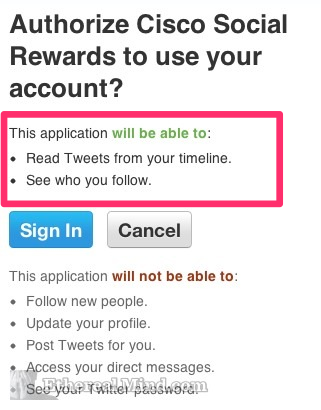 However, this has been implemented so that Cisco gets the rights to mine your timeline. As a result, leaving a comment on the Cisco Blog gives Cisco the legal and practical ability to invade your privacy. Why does Cisco needs to read my tweets, or see who I follow ? Are you really so desperate for new business that analysing my social graph is part of lead generation. Where is the reward ? Why do you need to mine my personal data just to leave a comment ? CCO login is not enough anymore? Isn’t this just for people without Cisco login, as an alternative?What if I don’t have logins on those social networks? This is very underhanded, I will be forwarding this on. if Cisco (the devil) requires that you give them that access. I would create a new account just for logging into their blogs. have no timeline. have no posts. have no followers. have no friends. i agree that this is bogus mis-use of their power..
at this point they are just as bad as Oracle.